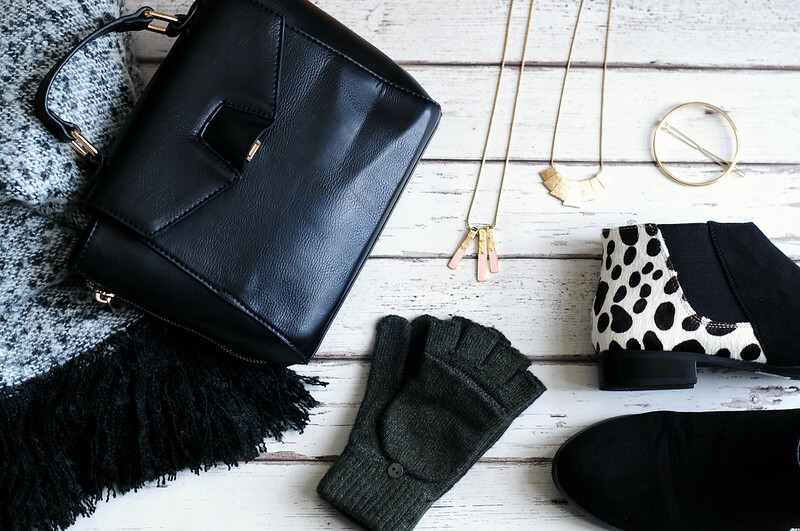 ASOS Oversized Scarf With Tassels In Boucle Knit | £10.50 // Liquorish Clean Mini Satchel | £25 // Pink Necklace // Gold Necklace // ASOS Circle Hair Brooch | £8.00 // Accessorize Gloves | £7.50 // ASOS AIZA Leather Chelsea Ankle Boots | £35. I am a winter person through and through and nothing makes me happier than bundling up in a thick jumper, boots, coat, hat, scarf and gloves. I thought I'd share a few of my favourites that have been making their way into my outfits on a daily basis. I think the dalmatian boots are one of my favourite purchases and I stalked the ASOS website until they came back in stock. Kate first blogged about them and I knew I had to have them. I have become slightly obsessed with dalmatian print over the past few months would love to have a shirt of the same print. Not that I would wear them together! I just love how these boots look with a simple dress or jeans and a t-shirt. I had a pair of gloves in this style when I was a teenager from Accessorize and I wore them until they completely fell apart. I don't know why it's taken me so long to buy another pair but I really love them. They keep my hands warm but I can take off the mitten part and am able to use my phone etc with ease. You can't really tell in this photo, but these gloves are tiny and this is coming from someone who has small hands to begin with. When I first bought them I thought I might have picked up the children's size by mistake. If you're going to buy these then make note of it. For the life of me I cannot remember where I bought these two necklaces from but I worn them a lot recently. I like that the pink necklace adds a bit of colour to an outfit and has a slightly longer chain. The plain gold one acts more like a collar necklace for when I'm wearing a jumper with a higher neckline. You can see my summer accessories post here.